When I read anecdotes from frustrated job seekers in the tech industry, they usually start out the same way. Sometimes the low response is warranted due to lack of qualifications or less obvious factors, but often the problem is simply that the job seeker never got access to the person/people who matter most in the hiring of technical professionals. Hiring bottlenecks start with the traditional application process (submit résumé blindly) and can be further complicated by HR reps that are hiring for disparate skills and business units. At a smaller company with no recruiters, the task of screening résumés may go to junior employees and administrative personnel with no background or training in hiring. When you like a company and want to get an interview, the ideal entrance is very rarely the front door. The front door is the advertised entrance that HR wants you to take, crowded with active job seekers with varying qualifications that will be culled or herded through the process by the people manning the door. After many years in the business I’ve learned that if you ask privately (meaning not within earshot of HR), most technical managers don’t want candidates to come through the front door either. They would rather you came through a back door, and if necessary to hiring protocol they will later introduce you to the front door guardians to ensure passage. HR mans the front door, but the geeks own the back doors. This is how it works at many employers. What are the more common back doors? Referrals – No news here. Clearly, referrals are the king of back doors, and a warm referral and endorsement from someone you know quite well is your best chance at interview. Agency recruiters – Agency recruiters, defined as those who recruit on behalf of companies but are not employed by them, have benefits and potential risks. Recruiter candidates are more likely to be submitted to hiring managers directly which eliminates the possibility of being screened out, and these candidates are subsequently moved along the hiring process at a quicker pace due to the recruiter serving as an additional facilitator. Once you’ve applied directly an agency recruiter usually can not represent you at that company for a period of time (could be six months to a lifetime), so if you intend on using this back door you should contact the agency recruiter first. Cold call – By cold call, I’m referring to introducing yourself through some means to a person you’ve never met. Applying online isn’t much different than a cold call really, but the recipient is not your ideal audience. A somewhat cold referral from someone you’ve never even spoken to is often preferable to the front door approach. Reaching out to a company employee that you don’t know may sound odd, but I’d usually recommend that tactic over sending a résumé to a jobs@ email address or an online application process. The cold call is most successful when the approached party has some vested interest in your potential hire. That interest could be their ability to work with talented people (you), the possibility that your hire may lighten workload, or something more obvious such as a referral bonus or recognition for the hire. At worst an employee impressed by your credentials should be able to help you to navigate the process. Selecting someone that may have interest is the key in choosing who to approach. Who will be able to both understand your qualifications and gain directly by your hire? And how do we find them? There are several more creative methods and means to the cold call for tech pros. LinkedIn – Send a short note detailing your interest in a company to someone who may hire you or work alongside you if hired. Meetups and networking events – A brief personal introduction and expression of interest at an event along with a follow-up email has been a recipe for many new hires over the past twenty years in tech. Just attending the event shows mutual interests, and your attendance will be a positive when a contact mentions you to co-workers. Industry sites and newsgroups – Sites like Hacker News or Reddit enable you to interact with commenters that you may discover are employed by companies that interest you. A private message may be effective to start dialogue. Posting publicly about job searches in tech newsgroups or Q&A sites like Stack Overflow is considered gauche, but appropriate private messages inquiring about employment aren’t generally frowned upon. Blogs – Companies create engineering blogs for several reasons, with recruiting being one benefit. An insightful comment or a counterpoint could lead to dialogue with the engineers that maintain the blog. Personal blogs of company employees are a bit trickier, as commenting on family photos resembles stalking more than professional networking. Stick to technical commentary and dialogue to be safe, and steer things offline as soon as possible. GitHub – I’ve heard more than one development manager talk about identifying and eventually hiring programmers met through an interaction on company or personal GitHub repos. For a hiring manager, this shows you have interest in their projects and provides the ability to see your code. Of all the back doors, this could arguably be the most effective. Twitter and other social – Following, favoriting, retweeting and replying to a small company’s tweets or posts is not as valuable as some of these other methods but could get a bit of positive attention if done properly. Again, go for showing interest and support without pandering. Protip: Regardless of the cold call method, don’t send a résumé on the first pass. Let them ask for it. Conclusion: Sending resumes to jobs@ addresses and applying online can be an enormous waste of time. Spend your job search time researching, identifying, and exploiting some of the backdoor methods to access decision makers directly. Like this? 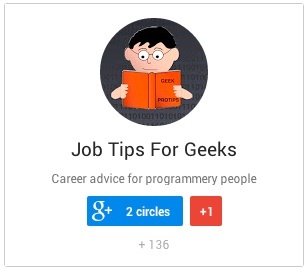 Check out my ebook Job Tips For GEEKS: The Job Search. The only back door I believe in is the contract recruiter or managed service provider. This is usually temporary with no benefits and absolutely no hope of full-time. Some of the other back doors are good if you have a high demand development position. In such high demand they will actually sponsor you , if you are not a citizen. Otherwise, the odds are so stacked against the job seeker! Thanks for reading. My writing tends to be for developers of varying demand, so I can understand where professionals in different areas of tech would have different experiences. Your mention of sponsorship and citizenship is a whole different situation though. I think these backdoor methods would potentially be even more effective for candidates who required sponsorship, as employers might not even realize that a candidate required sponsorship until they were already engaged in dialogue. If I required sponsorship, I’d rather have a dialogue and get the employer to like me before the employer knew I required sponsorship, as opposed to submitting a resume that said ‘sponsorship required’ and having them dismiss me potentially before even getting to know me. I Can’t Ask Your Salary History? Thanks!